In a word: In order to form an imperfect Union. Official web site (Daily Scoop is off the Eats List as of posting). JM ate a dish of cookies and creme. Nichole ate an egg salad sandwich. JM gave Memorial Union Daily Scoop Deli a B+; Nichole gave Memorial Union Daily Scoop Deli a B (see our grading rubric). We decided to tackle the Memorial Union Daily Scoop as their primary audience, students, would: we picked a day when we were overscheduled, stressed out and eating erratically. In that context, Daily Scoop is a perfectly serviceable deli. The new fall hires on the staff were finding their feet. Combine that with a gorgeous sunny day and you get a long line for Babcock ice cream, and your egg salad sandwich might get rung up as a cheeseburger, but that's OK. The egg salad sandwich was the apex of cafeteria style: Nichole could still see the scoop marks. The moderately-mayo'ed eggs were rubbery (we admit, we've been spoiled by the farmers' market) and included exactly one tiny bit of shell for authenticity and extra calcium. JM's cookies and cream dish was good but not great. 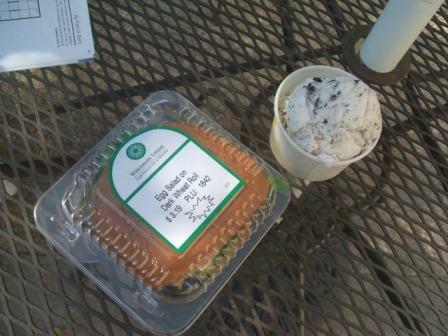 The best thing about Union ice cream is that a "single" scoop, whether cone or dish, can include 2 flavors. Choose well and choose often. Punny school-spirit flavors (Grainger Granite Crunch, School of Medicinnamon, Badger Blast, Union Utopia) often steal the show, especially when combined with the above-average vanilla and chocolate produced on campus. The Union delis also have one of the most generous coffee-loyalty cards around at buy 5, get one free, and the Johnson Brothers coffee they serve is more than fine. You can do worse than a Union deli, but the kicker is you can do so much better if you venture the short walk to the food carts or State Street. It's actually cheaper to eat at a food cart and the quality is so much better, especially if you go to Buraka, the Indonesian Cart, or Jamerica. When it's nice out I get something at Library Mall and wander over to the terrace to gaze at the lake and chow. It's one of the quintessential Madison experiences. I like / love the ice cream, since you get find many combinations that are not "commercially" produced, but wouldn't bother trying anything else.